MACOMB, IL – The Western Illinois University Center for International Studies and the International Friendship Club will host an interest meeting about the International Bazaar from 5-6 p.m. Tuesday, Oct. 24 in Memorial Hall 341. The International Bazaar highlights the unique cultures at Western. 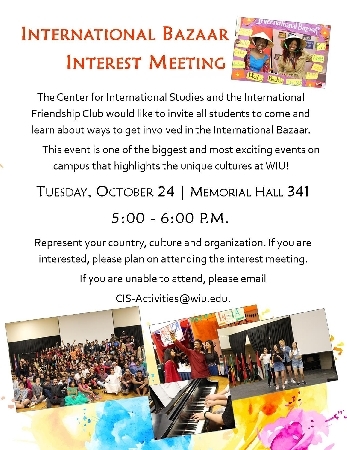 The interest meeting will present ways to get involved with the annual event.